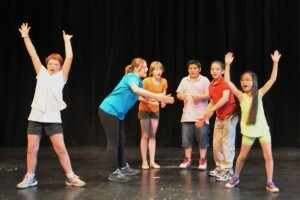 The Miners Foundry Cultural Center and Dinah Smith will present an Acting / Musical Theatre Combo Summer Camp for kids ages 8-14 from June 12 through June 26, 2014 at the Miners Foundry. Each day’s session will run from 9:30 a.m. – 1:15 p.m., with a special Showcase performance on Thursday at 12:30. Tuition is $200.00 and includes all materials. 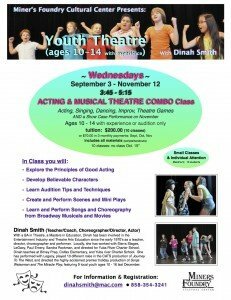 For information and registration, please contact Dinah at (858) 354-3241 or dinahsmith@mac.com. 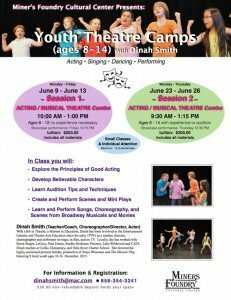 The Miners Foundry Cultural Center and Dinah Smith will present an Acting / Musical Theatre Combo Summer Camp for kids ages 8-12 from June 9 through June 13, 2014 at the Miners Foundry. Each day’s session will run from 10:00 a.m. – 1:00 p.m., with a special Showcase performance on Friday at 12:15. Tuition is $200.00 and includes all materials. 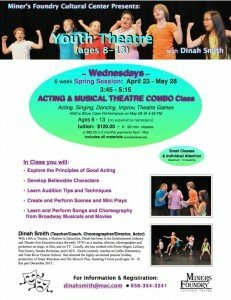 For information and registration, please contact Dinah at (858) 354-3241 or dinahsmith@mac.com. 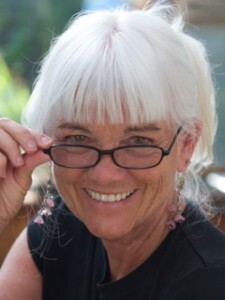 With a Bachelor of Arts degree in Theatre and a Masters degree in Education, Dinah Smith has been involved in the entertainment industry and theatre arts education since the early 1970’s. Dinah has worked as a teacher, director, choreographer, and performer on stage, in film, and on TV as well as with a number of local theatre organizations. 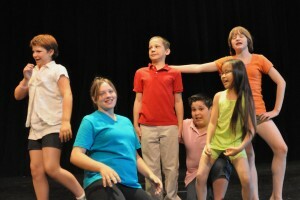 Most recently, Dinah directed the highly acclaimed premier holiday production of Sonja Weissman and The Miracle Play, featuring 9 local youth performers. 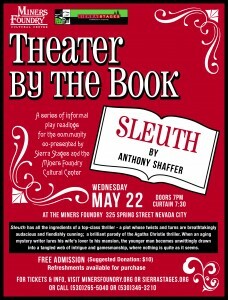 Theater by the Book, a series of informal play readings for the community co-presented by Sierra Stages and the Miners Foundry Cultural Center, returns Wednesday, May 22 with a reading of the Tony Award-winning play Sleuth, directed by Susan Mason and featuring local actors Jeffrey Mason and Danny McCammon. Sleuth has all the ingredients of a top-class thriller – a plot whose twists and turns are breathtakingly audacious and fiendishly cunning; suspense and excitement galore; and a brilliant parody of the Agatha Christie country-house thriller. Written in 1970 by Anthony Shaffer the play is set in the English manor house of Andrew Wyke, an immensely successful mystery writer, played by Mason. Wyke’s home reflects his obsession with the inventions and deceptions of fiction and his fascination with games and game-playing. He lures his wife’s lover, Milo Tindle played by McCammon, to the house and convinces him to stage a robbery of her jewelry, a proposal that sets off a chain of events that leaves the audience trying to decipher where Wyke’s imagination ends and reality begins. 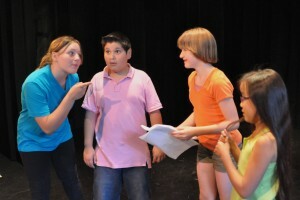 Susan grew up in Grass Valley and met Jeffrey while performing in a production of Oliver! at the Nevada Theatre in 1976. Since then the two have worked together in over thirty shows and lived throughout California and Oregon. The Mason’s threw themselves back in to local theatre two years ago after Jeffrey retired from teaching theatre arts at the university level. 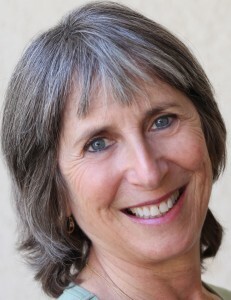 Most recently, Susan directed Assassins for Sierra Stages and Alice in Wonderland for Quest Theatreworks and acted in Sierra Stages’ production Death of a Salesman, while Jeffrey has directed The Music Man and Death of a Salesman for Sierra Stages. 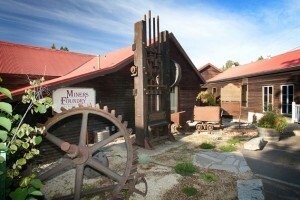 Both also participated in the popular 24 Hour Plays produced by Sands Hall at the Miners Foundry. Also in the cast is seasoned actor Danny McCammon. McCammon has performed in numerous local productions, including Sierra Stages’ Assassins and CATS’ Journey to the West. He also performs in the Best Friends Club Sketch Comedy Group, and will be seen in Sierra Stages’ summer production of the musical Avenue Q at the Nevada Theatre. The Theater By the Book readings are FREE (with a $10 suggested donation). Each reading is on a Wednesday evening – doors open at 7 and the reading begins at 7:30. The rest of the play reading series will be entertaining as well, with a wide variety of plays: Sleuth will be followed with a comedy (Lettice and Lovage), a drama (The Effect of Gamma Rays on Man-in-the-Moon Marigolds), a sprawling historical epic with music (Zoot Suit) and one reading to be announced. Jeffrey Mason will direct the Peter Shaffer comedy Lettice and Lovage the third installment of Theater By the Book on Wednesday, June 19, 2013 at the Miners Foundry.